The Adjustable Light Spread allows growers to create ideal lighting conditions across all stages of plant growth for increased vitality, health & yield. Made of 95% reflective proprietary German aluminum. 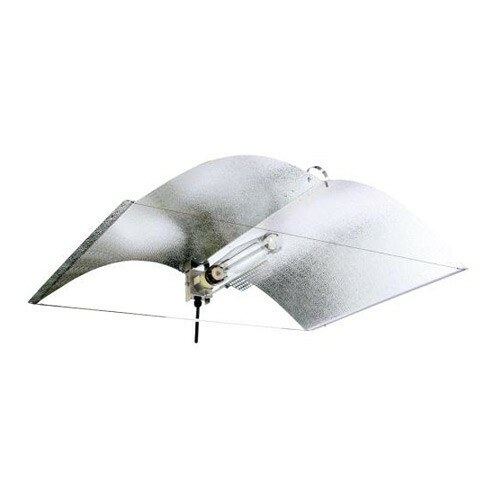 Twice the power and efficiency of most other reflectors. Increase the growing area under each lamp by up to 75%. Increase yield per lamp up to 50%. Sold in 17 countries across 4 continents, Adjust-A-Wings are the reflectors of choice for many of the world's top growers! Medium Dimensions: 22 in x 24 in, 25 in, 26 in or 27 in. Large Dimensions: 28 in x 36 in, 37 in, 38 in, 39 in or 40 in. An additional socket assembly can be added to a Large Adjust-A-Wing. Allows operation of two 400 watt MH & HPS lamps or two 600 watt HPS lamps. Log on to YouTube and search Adjust-A-Wings to see a demonstration video from the inventor.